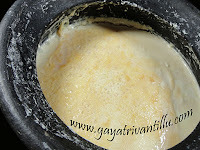 Take the curd in a deep bowl and beat it with whisker. Then it becomes smooth. Keep it in the fridge till use. Wash all the vegetables and cut them into big pieces. Remove the skin of the vegetables and keep aside for further use. Cut the vegetables into big pieces. Take these vegetable pieces in a microwave bowl and add 25ml water and cook in a microwave. Cover the bowl partially and microwave on high power for 7 minutes. Then stir it and microwave on high for 5 minutes. Check if the vegetables are cooked. If not, cook for another 5 minutes on high power. If you allow the standing time of 5 minutes then you can avoid the third time cooking in microwave. Keep them aside to cool completely. 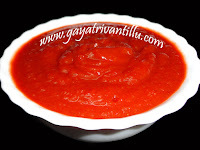 Grind the ingredients along with the vegetable peels to a fine paste by adding sufficient water. Paste should be fine and smooth. Taste lies in the paste being smooth. So take care while grinding to get the right flavor. Take out the whisked curd from the fridge and add the paste to it. Mix well. Add salt and mix again. Now add the vegetables (when they are cold) and mix. Now take a pan and heat it. Add oil and heat it. When oil is hot add mustard seeds, cumin seeds and fry well till they splutter nicely. Now add curry leaves, asafoetida and mix well. Add this entire thing to the curd and mix well. Keep it in fridge till use. Serve garnished with chopped coriander leaves. Serve it cold with hot rice.